Finishing off chiffon fabric can be tricky. Anyone who has sewn with it before will probably tell you that it slips all over the place, that it snags sometimes, that it can get away from you, and that it frays badly. 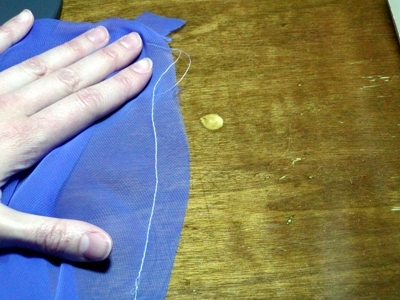 This article will show you how to hem chiffon by finishing the edges. 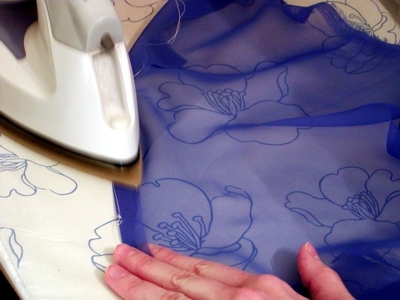 1) To finish off chiffon, I usually will hand or machine baste along my fold line. This gives me a definite line of demarcation. It can be carefully removed later. Note: Make sure that your chiffon can handle an iron. The chiffon I am using here is 100% polyester. 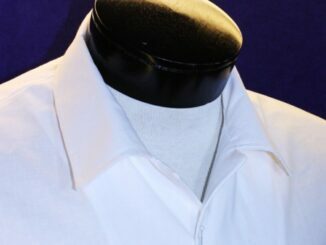 I used the polyester setting on my iron and tested a scrap piece first, just to be sure. If your chiffon is too delicate to handle an iron, you can finger-press or even lay something heavy on the edge to make a crease. This step can be skipped altogether, however I find it helps to make the crease. 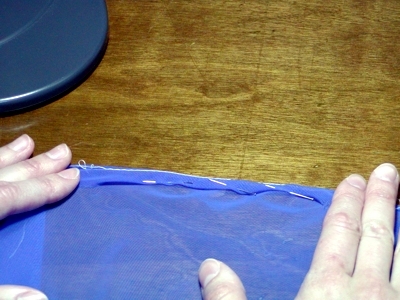 3) Now that my edge is defined, I fold under the raw edge and pin. I then use a whip stitch to finish off the edge. I make my stitches very close together – about 6 to 8 stitches per inch. 4) Finally, I remove the basted line along the fold line. I ironed the fabric flat one last time to give it a crisp edge.